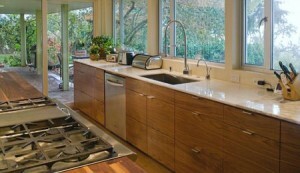 Portland, OR – March 1, 2011 (via PressReleaseNation.com) — The kitchen has grown up. Far beyond its past as a private, isolated space for solitary food preparation, the kitchen functions today as a center of home life. As such, kitchen remodels are among the most important projects that remodeling contractors carry out, affecting the quality of the home’s culinary, social, and spatial/circulatory functions. This prominence of the kitchen in the home is a departure from the past. In the old days, kitchens were private spaces where the designated chef of the family, usually the woman of the household, toiled away on food preparation in isolation, separate from the central living spaces of the house. Today, that’s been turned on its head. While the kitchen has core functions that it must provide – those of storing, cooking, and cleaning – it is also the high-traffic focal point of the home. The kitchen has become a bona fide living space in its own right, often with multiple entry and exit points. In its kitchen remodel work ( http://1clik2.com/HammerHandKitchenRemodelBlog ), Hammer & Hand recognizes this nexus of spatial and programmatic forces, and actively engages with it as it collaborates with clients and designers to reinvent, reinvigorate and transform kitchen spaces. 1. Workstation design to create a comfortable and efficient space for food preparation, cooking, storage and cleaning. 2. Space planning to orchestrate and facilitate flow with adjacent rooms and through the house in general. 3. Design to support the social functions of the space, including elements like islands for food preparation, seating nooks for conversation, and integral spatial connections to adjacent rooms. 4. The full gamut of design styles, from Victorian restorations to high concept modern designs. 5. Craftsmanship and precision, coupled with sustainable design and construction expertise. These facets of Hammer and Hand’s kitchen remodeling work combine to create vibrant and sustaining centers of home life.